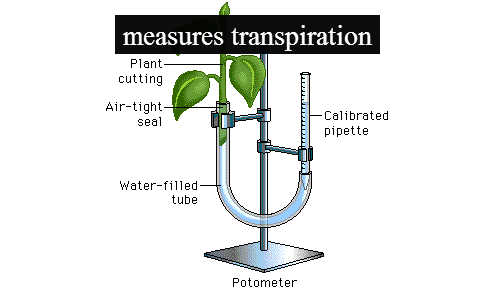 A potometer also known as ‘transpirometer’ is a tool used for measuring the rate of water loss of a leaves of the plant. The major reason for water loss is transpiration and photosynthesis.... Use food colouring in the capillary tubing to make it easier for pupils to see the changes in rate of water uptake. We hope you enjoy the video and that it helps you to successfully set up a potometer. Science & Plants for Schools: www.saps.org.uk Potometer and water transport in plants – Teaching and Technical notes: p. 3 Suppliers Suitable glass jars (sold either as 60ml powder bottles or 60ml wide necked bottles) are... Potometer, Griffin Ideal for laboratory and field use, this apparatus allows the student to measure transpiration with minimal risk of breakages. The apparatus has only one glass component (the capillary tube) and is mounted on a strong backing plate. 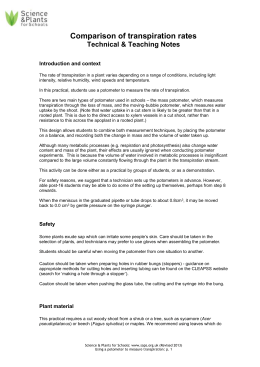 Southern Biological—A Division of Cogitamus Pty Ltd “a world of learning” Potometer Instructions Introduction Your potometer will measure transpiration and liquid uptake of a plant sample using …... Transpiration also plays a big role in helping water move around the plant by changing the water pressure in plant cells. This helps minerals and nutrients move up the plant from the roots. This helps minerals and nutrients move up the plant from the roots. This potometer enables the immediate, real-time evaluation of continuous changes in plant water use in response to modifications in the environments of the roots or shoots. Thus, it is a useful, low-cost laboratory instrument for diverse physiological research into plant-water relations. Use food colouring in the capillary tubing to make it easier for pupils to see the changes in rate of water uptake. We hope you enjoy the video and that it helps you to successfully set up a potometer. In the Initial Investigation, students create a potometer using a pressure sensor and they monitor microclimate conditions using a weather sensor. The potometer measures transpiration by detecting the change in pressure due to the evaporation of water from the leaves of a plant sample.